The Stony Brook men’s basketball team looked hopeless in Tuesday’s loss to Hofstra. With 6:25 left in the game, the team was down 32 to Hofstra, its largest lead until that point. The Seawolves had not scored a single point for more than two minutes. The Seawolves drought was only made worse by the Pride’s monsoon. Hofstra soon increased the lead to 42, the largest advantage of the game. The Pride took advantage of several free throws in three minutes, gaining 10 points. The Seawolves, on the other hand, could not get anything going offensively and only scored two points in those same three minutes — junior forward Tyrell Sturdivant and senior guard Kam Mitchell split a pair of free throws. The Pride simply overpowered the Seawolves and won the battle between the Long Island teams, 96-58. It was the worst loss Stony Brook has suffered since falling to Villanova, 78-35, in 2005. Shooting was a problem early on for Stony Brook. The Seawolves shot 1-8 to start the game, while the Pride built a 10-2 lead. Redshirt freshman forward Akwasi Yeboah, in particular, had a rough night shooting the ball. The leading scorer for the Seawolves in the last two games could not get anything going, shooting 1-for-9 from the field and 0-for-4 from three-point range in the first half. Sturdivant also struggled throughout the game. Hofstra forward Rokas Gustys, at 6-foot-9-inches tall, took advantage of his match-up against the smaller 6-foot-7 Sturdivant and attacked the post as often as he could. Sturdivant was overwhelmed, allowing Gustys to score 11 points and grab 18 rebounds. In fact, Hofstra outscored Stony Brook 34-24 in the paint and had 22 second chance points while the Seawolves only had 10. The entire Seawolves team was just outmatched. Despite junior forward Jakub Petras’ career-high seven rebounds, Stony Brook lost the battle on the glass, 59-30. The team also only shot a season-low 44 percent from the free-throw line. The lack of success at the line, coupled with a “fire-at-will” mentality from the Seawolves, cost the team in the first half. They shot 2-for-13 from beyond the arc in the first half. The second half proved to be a little better shooting wise, with Stony Brook making four three-pointers on 15 attempts. However, it was not enough to stem the bleeding. But not all was lost for Stony Brook. Freshman guard Michael Almonacy emerged as a weapon off of the bench. He was the Seawolves’ saving grace, scoring a career-high 15 points to the lead the team in scoring. Not only did Almonacy show prowess as a scorer, but he, along with junior forward Roland Nyama, also led the team with three assists. However, Nyama struggled to score, recording four points in the game total and going scoreless in the second half. 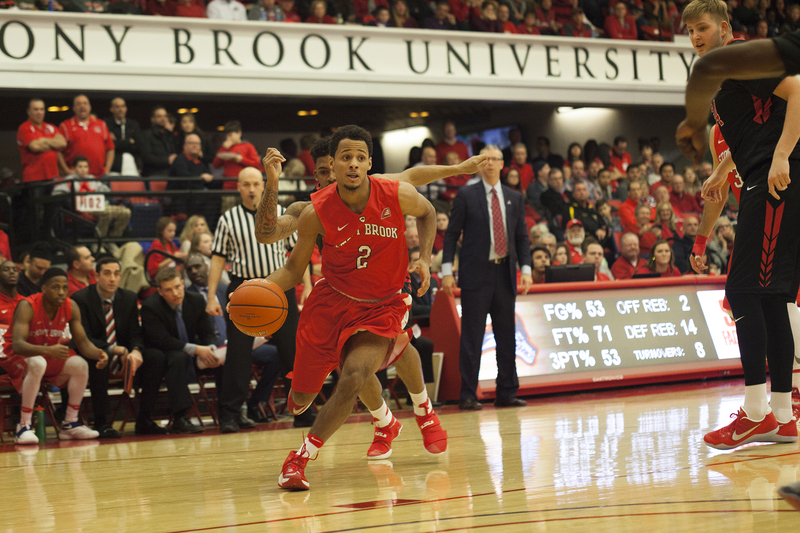 Stony Brook will continue its road trip on Saturday, Dec. 17. The team heads to Loretto, Pennsylvania to take on Saint Francis at 1 p.m.